What should I do if there is a discrepancy with my order? We use the latest software in our warehouse to ensure you receive your order as expected. However, if something is not right with your order, the best thing to do is contact us as soon as possible and we will do everything in our power to resolve it for you. If you have been shipped the incorrect goods then please do accept our apologies. Please use the free returns label to return the incorrect items and any replacements will be sent to you at no extra cost to yourself. Please note: We are not able to refund the cost of returning goods by other methods – please use the free returns label provided or contact us to obtain a replacement label. We recommend packaging the items securely and requesting proof of postage (free from a Post Office) for all returns. Please retain proof of postage as you’re responsible for the return(s) until they’ve been received by us. What's the difference between the levels of mouthguards? All OPRO Self-Fit sports mouthguards have been designed to provide protection from potential injury to teeth and soft tissue and to remain firmly in place when being worn. The level of protection and retention increases with each level of mouthguard from Snap-Fit through to Power-Fit. In order of most protection and retention to least: Power-Fit, Platinum, Gold, Silver, Bronze, Snap-Fit. If you have any questions about the differences in protection levels, please do not hesistate to Contact Us. Teeth, unlike bones, do not heal. Injury to teeth is permanent and the effects can be traumatic. Using a well-fitting, CE certified mouthguard gives your teeth and gums the best possible protection from dental trauma. What is Antimicrobial and why do I need it? Bacteria can thrive in the most unlikely of places, something that is best avoided in an item that goes into your mouth many times during its lifetime. From Silver level upwards, OPRO Self-Fit sports gum shields contain a Biomaster antimicrobial additive. This odour and taste-free additive protects the product against bacteria for the lifetime of the product, including antibiotic-resistant bacteria such as MRSA. At what age would I change from a junior to an adult mouthguard? Our junior mouthguards are suitable for children up to age 10. When they reach the age of 10, we suggest that you use an adult mouthguard. It’s worth bearing in mind that children do grow at different rates, therefore a children’s mouthguard requirement is based on the individual - this is a general guideline based on our experience. I wear fixed braces, so what's the best option for me? We have mouthguards suitable for individuals with fixed braces. They have been specially designed to fit around a fixed brace and still provide the same level of protection as the non-brace versions. We have braces versions of our mouthguards which are suitable for wearers of fixed braces. They have been specially designed to fit around a fixed brace and still provide the same level of protection as the non-braces versions. Should I be wearing the mouthguard to sleep? Definitely not! Gum shields are not designed or intended to be worn at night. If you suffer from bruxism (teeth grinding), contact us at oproenquiries@oprogroup.com about our specially-designed night guards. I tried moulding my mouthguard but it still isn't the exact fit I want, can I boil it again? Absolutely. Provided that you follow the moulding instructions carefully and do not leave your mouthguard in the hot water for longer than 20 seconds on each occasion, our mouthguards can be moulded multiple times. What makes an OPRO mouthguard different to others? 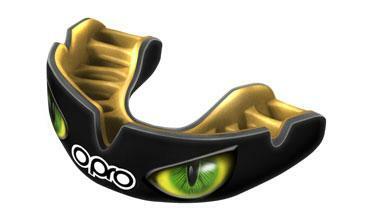 OPRO Self-Fit mouthguards feature our unique fin technology. These fins are rib-like structures that soften and become gel-like in hot water. Based on millions of dental impressions, thes fins are placed in exactly the right place to grip your teeth. Between the hot water bath and anatomical placement, the gum shield moulds snugly around your teeth and soft tissue to provide outstanding fit and retention. What's the difference between single and double layer protection? All OPRO Self-Fit gum shields are fully CE certified. This guarantees that every mouthguard meets the required standards for protection and retention. From mouthguard level Silver and upwards, a second layer has been added to provide even more retention and extra peace of mind when playing your sport. How do I clean my mouthguard? We suggest using OPRO cleaning tablets to ensure your mouthguard stays hygienically clean and minty fresh. Do not use toothpaste or anything abrasive as this will cause damage to your mouthguard. This depends on your age and the condition of your mouthguard. Children and those undergoing orthodontic treatment should change their gum shields on a regular basis. Mouthguards should also be inspected frequently to check for any signs of wear and tear. Please also note that our comprehensive dental warranty is only valid for a year from the date of purchase. How do I mould my mouthguard? Follow the instructions carefully on the fitting leaflet and also refer to our video tutorial for real-time fitting advice. If you experience any difficulty with moulding your OPRO Self-Fit mouthguard, please contact us at info@opro.com where one of our experienced customer care team will be happy to help. Do OPRO Self-Fit mouthguards contain latex? No, all of our mouthguards are latex free. Yes, we offer a 14-day return guarantee. Find out more here. Please take a look at our careers page for information about working at OPRO.